Cassie is a teacher in more ways than one! She is a mother, to a wonderful daughter and son, and a wife. She has a Master of Arts Degree in Education, a Bachelor of Arts Degree in Education, and has taught 4th and 1st grade, all before finding her Dream Job- Teaching yoga to children ages 2-92! Cassie found Yoga in college, and continued to grow her practice into pre-natal yoga. Haris Lender, founder of KAY, took Cassie under her wing to develop her into a teaching machine 🙂 Haris and Cassie taught all over St. Petersburg, FL and later developed the KAY Teacher Training program. Cassie has been the Assistant Director of Camp Yogaville in Yogaville, VA, and Camp KAY in Ellenton, FL. She was even KAY’s very first licensee! 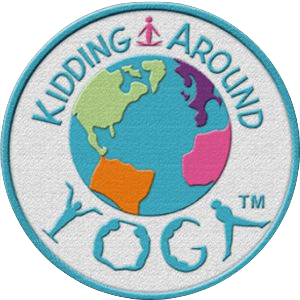 Currently, you can find her teaching Yoga to all ages, all over Pinellas County: Chair Yoga, Stretch, Gentle Flow, Mindful Flow, Intermediate Hatha, Beach Yoga, and Pre-KAY in multiple day cares and preschools weekly. Check out her Class Schedule and My Events sections below for updated information on classes, trainings, and book signings. Happy Birthday to YOU, Little Yogini! Yoga Birthday Parties are unique and individualized, including a kid’s yoga class, arts and crafts, and a special birthday story and message (perfect time to make memories with friends and loved ones!). A former Brownie myself, I know the importance of team building and community relationships. Kid’s Yoga is another way to support your troop with Stress-Management Techniques, life-long tools. with Cassie Dixon, co-author of Kidding Around Yoga "Yoga Stories"